Is it a requirement for all seminars to be boring? 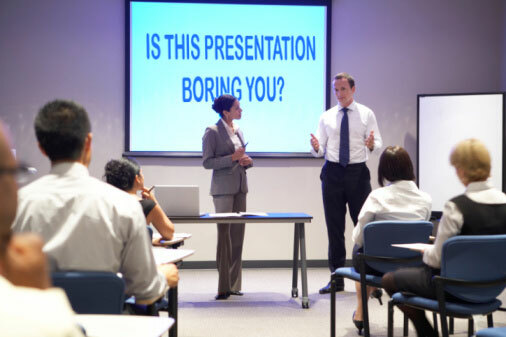 Seriously, I don’t want to be cruel and trample on anyone’s efforts but I don’t think I’ve ever attended a seminar that kept me alert and involved–let alone entertained. In a not-so-scientific estimation, I’m going to predict that the majority of seminar attendees are with me on this. Five percent. Your name, the name of your product and the name of your company is probably close to 1% of that. So the true stat would come out to about 4%. Four percent retained in your lecture. “But I don’t do a lecture, I conduct a seminar,” you may have thought after reading that. Okay, then if it’s a seminar…why does it feel like a lecture? BECAUSE EVERYONE IS BORED OUT OF THEIR MINDS! Just because you, as the host, attended seminars in the past where some old guy spent two hours crawling through a slide show, don’t think that this a model you should follow. Trust me, if you hated it when you experienced it, the rest of us ain’t gonna like it either–no matter how great your company is. And the free bagels and coffee isn’t gonna make up for the colossal waste of time we all will experience. I’m sincerely not trying to be rude but it is a waste of time. If you’re going to spend all the money to prep for an event like this by booking a hall, catering the food, paying a staff and renting equipment, wouldn’t you want the audience to leave with an incredible understanding of the content? Of course you do. So, how do you achieve that? Switch it up. Get away from normal or mundane and put on an exciting, interactive education “show”. Yes, I said a show. Something that requires prep and rehearsal. Put on a presentation that may require multiple people to pull off. If you can’t handle it, hire a team that can. At the end of the day, your goal for your audience is to retain the information. Take it one step further, if the audience works for your company, you absolutely need for them to retain as much as possible so that they can move your product more efficiently with higher production. Christina then continues in her piece and gives great tips and suggestions on how to get your audience engaged. It’s a great article and you can read it HERE. Just take yourself back to grade school. Do you remember that history teacher with the monotone voice who said, “In 1734, the southern colonies were integrated into a large division of……zzzzzzzzzzzzz”? You don’t remember the rest right? Why? You hated that class and you struggled to pass it because you found it very difficult to learn from that teacher. Then why do that to your clients, peers, expo attendees or colleagues? Change things up and make it fun. It doesn’t matter what the subject matter is, people stay awake and retain information when they are having fun. And then they become advocates for whatever it is you’re teaching. Enjoy yourself and they will enjoy themselves. Categories: Attendee, Business, Exhibitor, InternetTradeShows.com | Tags: brunel university, convention, expo, lecture, london, rb holbrook, seminar | Permalink. At the 2012 MCM ComicCon Convention in London, a fan who tried to be funny, got a taste of a capture much like Luke Skywalker experienced. Watch the whole video. It’s pretty funny. Poor kid probably thought it would never end. Categories: Attendee, InternetTradeShows.com | Tags: comicon, darth vadar, jedi, london, luke skywalker, mcm, star wars, storm trooper | Permalink. Wayne was the voice of “Prowl” on the hit Fox television show, Transformers: Robots in Disguise. 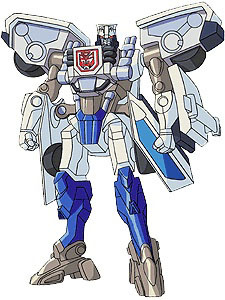 Of all the impressive notches on my resume, one of the credits I’m most proud of is when I worked as the voice of “Prowl” from the Fox TV series, Transformers: Robots in Disguise. I’ll never forget when my agent called me and told me I had an audition for Transformers. The popular cartoon was a household name worldwide. When my agent called again to tell me that they cast me for the show, and as one of the lead roles, I was like a little kid in a candy store. It was really awesome! After my episodes were released, me and scattered other characters from the television show were hired to make appearances at conventions and expos all around the world. Wow! I can’t even begin to break down some of the wild characters that attend these shows. “Trekkies” (Star Trek Convention Attendees) have always had a reputation of being out there but when I walked into BotCon in London, England (2002), my jaw dropped. I witnessed grown men walking the aisles wearing full robot costumes. One father, dressed as me (Prowl) came up to my autograph table with his son to say hello. His son was wearing normal kid clothes but dad was in full on “TRANSFORM!” mode. Make no mistake, there were a lot of really nice fans in attendance, so don’t view this post as a bash-fest. I just feel the need to point out some of the really interesting peeps. Typical for this kind of gathering, everyone wanted the voice over actors to speak in their character’s voices. For some folks, I would leave messages on their answering machines or be Prowl on their voice mail. It was a good time. Like most fan conventions, the organization put together a panel of actors to answer specific questions from the live audience. My favorite question from the attendees at this show came from a 40-something year old man in the middle of the crowd, who raised his hand high and waited patiently to ask his favorite Autobot, Prowl, a very poignant question. “Yes, Prowl, in Episode 8, when you fell into the ocean, were you nervous because you’re metal? What were you thinking when it happened?” he sincerely asked. I paused. I was a little confused. I was a little concerned. I was a little amused. Categories: Attendee | Tags: botcon, convention, fox, fox kids, london, prowl, robot in disguise, trade show, transform, transformers, trekkies, wayne lewis | Permalink.